you can imagine the type of fish and seafood available in the Moroccan city Essaouira. The first thing I experienced there, as soon as we arrived, was being greeted by all those open restaurants by the coast, outside of the old city (known as Medina). The many, many grills, the woofs of BBQ aromas and the beautiful Sardines, the king crabs and that heavenly grilled Monkfish we had as soon as we stepped foot in that area! Truly a unique experience that is not to be missed when there. You are greeted with the smiling faces of the locals advising you to eat at their shop and then you sit in the outdoors, listening to the seagulls and smelling that BBQ aroma that is playing all sorts of hunger games with your stomach! Then you eat and music plays in your head… Heaven under an open blue sky by the ocean in the Moroccan west side! All of this, is nothing to prepare you for the Medina (see the info at the end of the post). 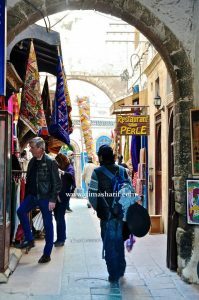 That old, walled and gated city, which as soon as you enter you seem to be walking in a maze of alleys, lined with beautiful, colourful linens that are hung by the storefronts every which way you look. Still trying to take all the beauty and colour you get distracted with strong aromas of the spice shops and the beauty of all types of tagine pots and table arts.. Absolutely beautiful! And you walk until you reach the riad, this beautiful, home-like, local hotel where you will stay is your first introduction to what it feels like had you decided to become a local resident. The beauty of the old, adapted into this fast, technological time we live in, makes you feel like you stepped back and instantly you feel relaxed. One of the things you must do when in Essaouira is visit the fish market, shop at the small galleries, spice shops and buy some of the most beautiful table arts and wood carving pieces they are very well known for. And the one most important thing to do is eat at the grill shops outside of the Medina, have that monkfish it is unforgettable! 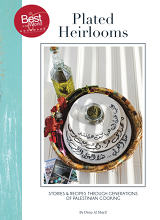 This recipe is one that I learnt and cooked with the local Essaouiran ladies I met when I was there. It is really one very unique flavour that I tasted in Morocco. We could not stop munching, dipping bread in and tasting this very interesting combination. They are known for this dish everywhere in Morocco. The mixing of sweet and savoury is their specialty. I loved this dish and wanted to share it with you. In a large bowl, mix the coriander, parsley, black pepper, ginger, turmeric, cinnamon, cumin, garlic, saffron and oil for a savory marinade called “shermoula” in Morocco. Marinate the fish with the shermoula on both sides and place inside a tagine pot. Add the 1/4 cup of water or chicken broth to the pot, then cook for 15 min (tip: Place some parsley as bed for the fish for a non-stick layer). Meanwhile, caramelize the onion with sugar, cinnamon stick, 3 tablespoons of oil and blossom water, on low heat for 25 min. When done, place on the top of the fish, sprinkle with sultana raisins and cover for extra 10 minutes before serving. Essaouira, formerly known as Mogador, is a city in the western Moroccan region on the Atlantic coast. The modern name means “the little rampart”, a reference to the fortress walls that still enclose the old part of the city. In the Berber language which is spoken by a sizeable proportion of the city’s inhabitants, it is called “Tassort”, meaning ‘the small fortress’. Until the 1960s, Essaouira was generally known by its Portuguese name, Mogador. This name is probably a corruption of the older Berber name Amaqdul that is mentioned by the 11th-century geographer al-Bakri. In 1506, the king of Portugal, D. Manuel I, ordered a fortress to be built there, named Castelo Real de Mogador. Altogether, the Portuguese are documented to have seized six Moroccan towns and built six stand-alone fortresses on the Moroccan Atlantic coast. The fortress of Castelo Real of Mogador fell to the local resistance of the Regraga four years after its establishment, in 1510. During the 16th century, powers including Spain, England, the Netherlands and France tried in vain to conquer the locality. Essaouira remained a haven for the export of sugar & molasses. In the 19th century, Essaouira became the first seaport of Morocco, with trade volumes about double those of Rabat. The city functioned as the harbour for Marrakesh, as back then it was only a few days from the inland city. As such, diplomatic and trade representations were established in Essaouira. The Medina of Essaouira (formerly “Mogador”) is a UNESCO World Heritage listed city, an example of a late 18th-century fortified town. There are only a handful of modern purpose-built hotels within the walls of the old city. Newer international hotels have been built along the sea front – the local planning regulations restrict buildings to 4 storeys high to help preserve the stunning views. There are also many beautiful privately owned riads, also known as dars, that may be rented on a daily or weekly basis. These Riads are really what one must experience when in Essaouira for a more authentic experience of the place. Essaouira presents itself as a city full of culture: The medina is home to many small arts and crafts businesses, notably cabinet making and their unique wood-carving (using roots of the Tetraclinis tree), both of which have been practised in Essaouira for centuries. Several small art galleries are found all over the town. Since 1998, the “Gnaoua Festival of World Music” is held in Essaouira, normally in the last week of June. It brings together artists from all over the world. Although focussed on gnaoua music, it includes rock, jazz and reggae. Dubbed as the “Moroccan Woodstock” it lasts four days and attracts annually around 450,000 spectators. 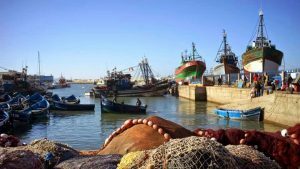 The fishing harbour, suffering from the competition of Agadir and Safi remains rather small, although the catches (sardines, conger eels) are surprisingly abundant due to the coastal upwelling generated by the powerful trade winds and the Canaries Current. Essaouira remains one of the major fishing harbours of Morocco. As such its local fish market is a testament of that. Essaouira is also renowned for its kitesurfing and windsurfing, with the powerful trade wind blowing almost constantly onto the protected, almost waveless, bay. A colourful and beautiful city of contrasts, a unique part of Morocco that is very much worth visiting.